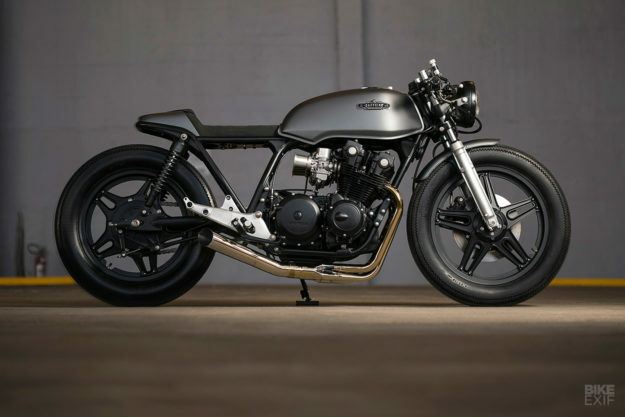 With a name like Caffeine Custom, you can probably guess which custom style influences this shop. 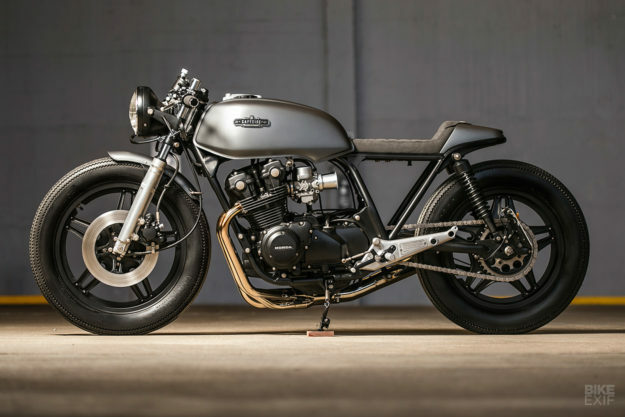 But you might be surprised at how good this Honda café racer is—and even more surprised to know where the shop is based. This perfectly proportioned CB750 isn’t from Europe or the States—it’s from the south of Brazil. 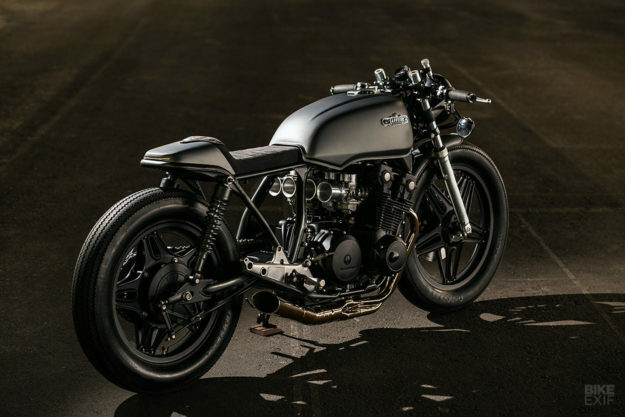 Caffeine Custom was launched four years ago by friends Bruno Costa and Tiago Zilli, and they’re based in a rustic old shed in Caxias do Sul, in the mountains of Serra Gaúcha. Head wrench Bruno is a former automotive designer who has traded his office for a workshop. Tiago’s a graphic designer and handyman, and handles Caffeine’s branding and communications. 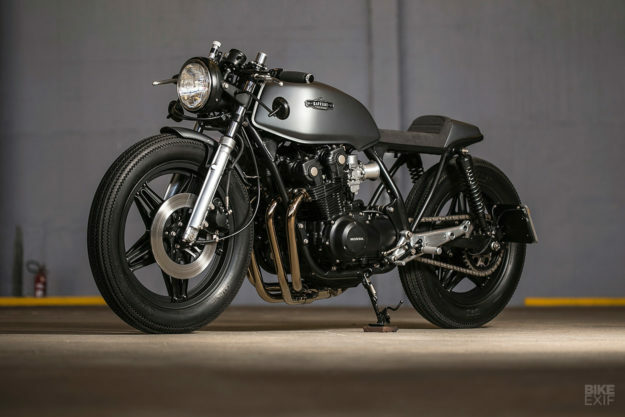 This Honda—dubbed ‘The Mighty Four’—started off as a 1979 tenth anniversary limited edition Honda CB750. And it showed a mere 8,000 miles on the dial. But after eight months of manipulating metal, fine-tuning and painting, it’s looking a lot sharper. 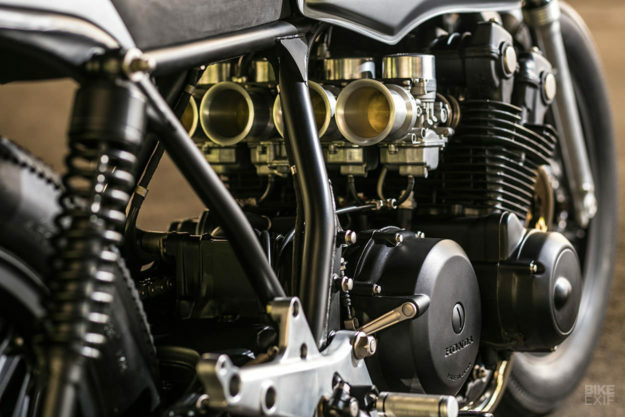 “We wanted to build an authentic café racer, combining classic style with an elegant and minimalist design.” And they’ve succeeded. 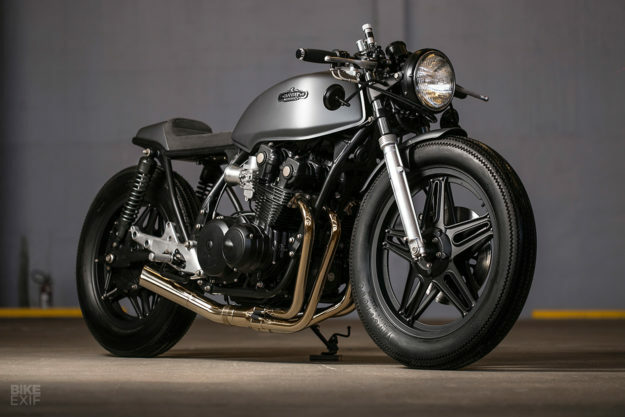 The stance of this CB750 is off the scale; we can imagine it cruising into view like a low-slung battleship. Fine-tuning that stance was the first job on the list, and meant lowering the front suspension. The guys then sourced an 18” Comstar wheel to replace the stock 17” unit, balancing out the front. Both are wrapped in everyone’s favorite tires: the Firestone Champion Deluxe. Next they whipped up a new subframe, topping it off with a hand-built rear cowl. And there’s more interesting stuff going on back there. For starters, the seat’s upholstered in Alcantara—complete with a flap that hides a smartphone storage pouch. 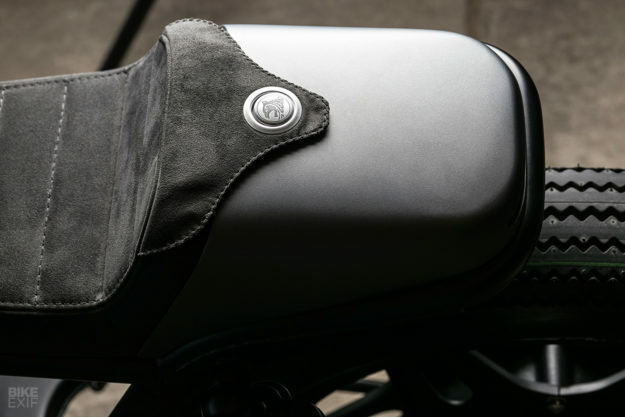 That seat hump also hides the key electronic components; a Motogadget m.unit controller and a small Lithium-ion battery. Naturally, the whole bike was rewired around this setup for a minimal and clean effect. A neat LED taillight does duty out back. Up front, Caffeine modded the top triple clamp with their logo. They then fitted clip-ons, complete with Biltwell grips and Motogadget buttons and bar-end signals. 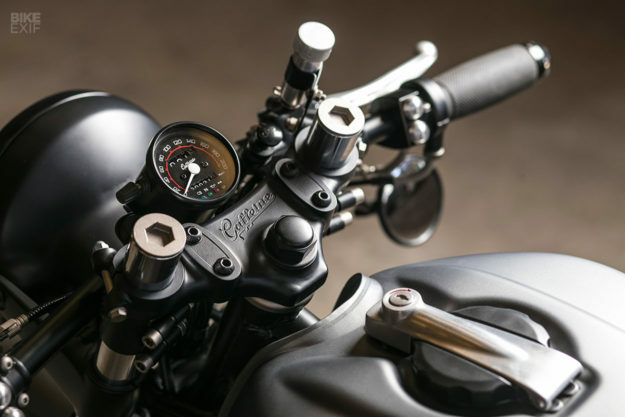 The brake control now features a nifty CNC-machined reservoir, and the speedo is a simple analog unit, complete with integrated idiot lights. 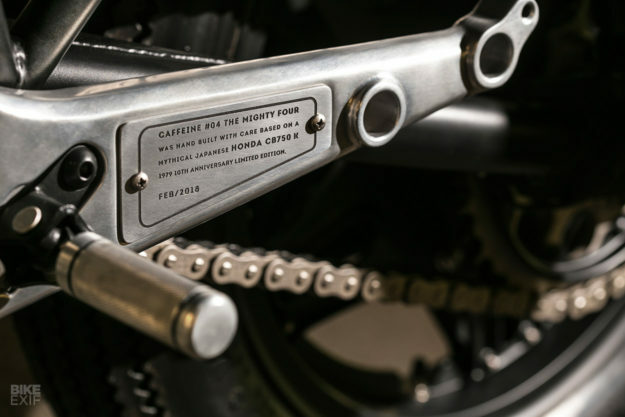 The CB750’s side panels didn’t make the cut, but its unmistakable fuel tank’s still there. The team kept the aluminum fuel cap, but added their own badges. The rest of the build is a mix of beautifully restored original pieces and subtle touches. Since the motor was low mileage and running great, Caffeine simply cleaned it up and refinished it in matte black. The OEM CV carbs now breathe in via a set of velocity stacks. And there’s a new stainless steel four-into-one exhaust system, ending in a beastly hand-made muffler. The brakes are stock, but the front fender, headlight and brackets are all new, and Honda CB900 Bol d’Or rear sets were fitted to help improve ergonomics. (There’s a small plaque commemorating the project, just behind the left peg). Caffeine are clearly masters of restraint. Everything here’s well judged and expertly placed, right down the final paint scheme; a simple, warm matte grey. There’s been a surge of interest in performance-orientated machines lately, but we find The Mighty Four’s analog vibe refreshing. It’s an elegant, low-fi reminder of why we love the CB750 so much—and a reminder to keep a closer eye on the Brazilian scene.